CELTIC fans have begun a campaign to stop John Reid from becoming the club's next chairman because of his role in the Iraq war. Thousands of shareholders have been urged to vote against the former Home Secretary's appointment at the AGM on Monday. The Celtic Trust, which has 200 members, cites the Iraq war alongside concerns over his close links with majority shareholder Dermot Desmond. Members have called for the board to launch a "wide ranging search" for a more suitable successor to Brian Quinn. 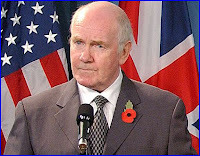 Mr Quinn, who turns 71 this month, is a former deputy governor of the Bank of England and has held the post since 2000. Flyers were handed out protesting against Mr Reid's nomination at a recent home game, and an internet petition has almost 1000 signatures. Jeanette Findlay, trust member and a professor of economics, said: "We have serious concerns about the appointment of this individual to Celtic Football Club. "The Iraq war was extremely unpopular with the public and we don't believe this appointment fits with the ethos of Celtic and how the fans see the club. "There has always been sympathy at Celtic for the plight of oppressed people. "We also have serious concerns about the selection process, which we believe is too narrow." The trust's members have also called on supporters to vote against Dermot Desmond's re-election. The internet petition, which is not connected with the trust, claims the appointment would be "contrary to Celtic's heritage as the invasion of Iraq has resulted in the deaths of thousands of innocent people". Mr Quinn, speaking in September, said: "I felt that the time was right to pass on the baton. I am delighted that, in John Reid, we have a man with the club's best interests at heart." BT executive Ian Livingston, 43, is also seeking election on to the club's board. Celtic football club refused to comment.